These two graphics are planning tools used by Mars Exploration Rover engineers to plot and scheme the perfect location to place the rock abrasion tool on the rock collection dubbed "El Capitan" near Opportunity's landing site. "El Capitan" is located within a larger outcrop nicknamed "Opportunity Ledge." The rover visualization team from NASA Ames Research Center, Moffett Field, Calif., initiated the graphics by putting two panoramic camera images of the "El Capitan" area into their three-dimensional model. The rock abrasion tool team from Honeybee Robotics then used the visualization tool to help target and orient their instrument on the safest and most scientifically interesting locations. The blue circle represents one of two current targets of interest, chosen because of its size, lack of dust, and most of all its distinct and intriguing geologic features. 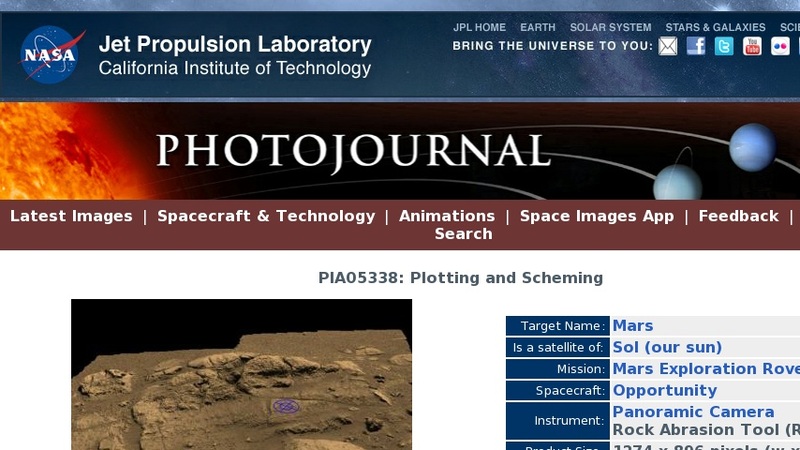 To see the second target location, see the image titled "Plotting and Scheming." The rock abrasion tool is sensitive to the shape and texture of a rock, and must safely sit within the "footprint" indicated by the blue circles. The rock area must be large enough to fit the contact sensor and grounding mechanism within the area of the outer blue circle, and the rock must be smooth enough to get an even grind within the abrasion area of the inner blue circle. If the rock abrasion tool were not grounded by its support mechanism or if the surface were uneven, it could "run away" from its target. The rock abrasion tool is location on the rover's instrument deployment device, or arm. Over the next few martian days, or sols, the rover team will use these and newer, similar graphics created with more recent, higher-resolution panoramic camera images and super-spectral data from the miniature thermal emission spectrometer. These data will be used to pick the best spots to apply the rock abrasion tool on two very distinct areas of "El Capitan." The upper and lower portions of "El Capitan" have different textures, and both areas should provide distinct and unique clues about the history of Mars. The rock abrasion tool will also enter the target areas from different perspectives, creating unique views simply by the way they grind into the different areas of the rocks. For the current upper target (Fig. 1), the rock abrasion tool would go into the rock as if from the side of a layered cake, while at the bottom target (Fig. 2), the instrument would enter from above as if going down the middle of a cake. "El Capitan" was named after a mountain in Texas, but on Mars, it is about 10 centimeters (4 inches) high. Scientists are eager to use the rock abrasion tool to peer deeper into the history of the formation of "El Capitan," and the team will spend multiple sols taking pre- and post-measurements of the rock targets. Opportunity will spend one sol moving in between target locations.